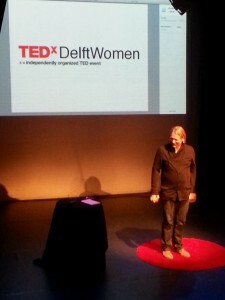 It’s the final countdown to the first TEDxDelftWomen event. In less than 24 hours, a diverse group of individuals with their own unique perspectives will take to the stage to share their ideas. There is definitely a feel-good vibe in the air at the Rietveld Theater. The speakers are chatting with each other like they’re old friends, meeting after years of being apart. But every now and then, there’s a quick glance at a piece of paper or digital medium as these are last moments of preparation. “If you use anecdotes, you have to say them correctly,” says Noa Brume. Following the quality of their content is the significance of presence and presentation. As the speakers consult with their coaches and stylists, technicians are checking the lights and sounds, and volunteers are buzzing, busy as bees. Everyone is preparing themselves for a great event. This year’s line-up of speakers is impressive. All have big ideas worth spreading and their personal take on authenticity. Indeed, there is inspiration on stage, and in the performances and presentations. Whether it’s reducing poverty, fighting for gender equality or demanding accountability, everyone has the ability to contribute to a better world. “Tomorrow’s going to be fabulous!” says TEDxDelftWomen licensee Molly Quell. While we’re proud to announce that TEDxDelftWomen 2015 is completely sold-out, those who are unable to attend can stay tuned for videos of the event, which will be posted on our website in the coming weeks. Make sure to checkout our program for our full line-up of speakers and practical information for the day itself. See you tomorrow for the first ever TEDxDelftWomen!